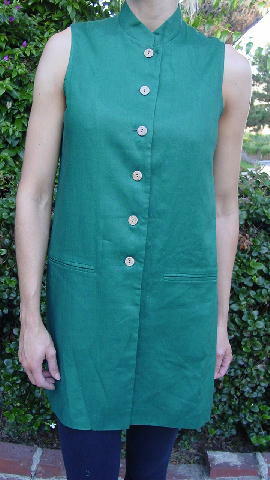 This emerald green sleeveless jacket is 100% linen with a lining of 100% acetate, and was made by Kenar. The tag says it's size 10 petite, but it fits like a size Small. It has six light tan and brown speckled buttons. 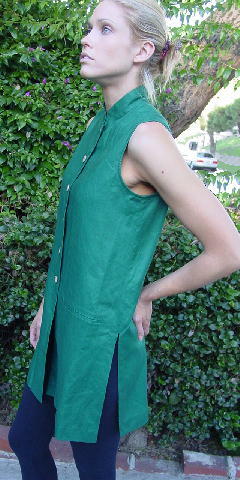 There is a 1 1/2" wide mandarin collar and 12 1/4" side seam bottom slits. 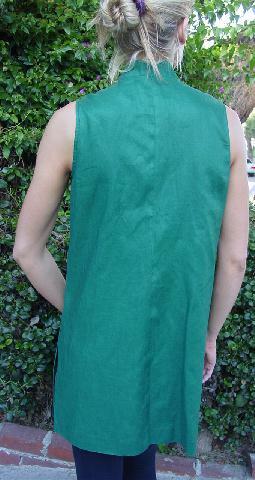 It has two front slash pockets, which are still sewn shut. It was used in a photo shoot, worn with Valentino Jeans tweed pants and a cream long sleeve Escada blouse.